I guess the title is a bit misleading, because in SharePoint 2007 and SharePoint 2010, the Description meta tag does not exist. Buried as an unmarked answer, within this thread. This works for both SharePoint 2007, and 2010 publishing pages, and it works well. Below is the reply I am referencing. So, Praggers, whoever you are, thank you. A note for 2010 (and possibly 2007, I did not take the 2 minutes it would require to find out, sorry! ), the “Description” field’s internal name is Comments. 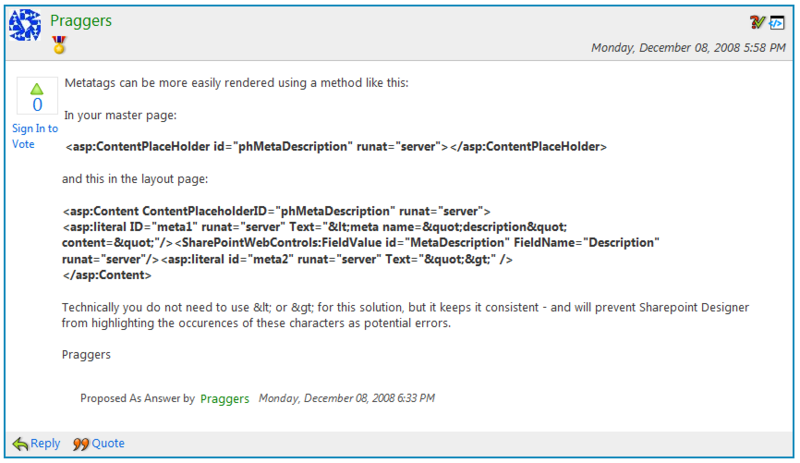 So be sure to change FieldName=”Description” to FieldName=”Comments” within the code for your page layout.